Jewelry and Keepsakes — Workman Funeral Homes, Inc.
We offer a large selection of personalized fingerprint jewelry including charms, necklaces, rings, cuff links, and more. 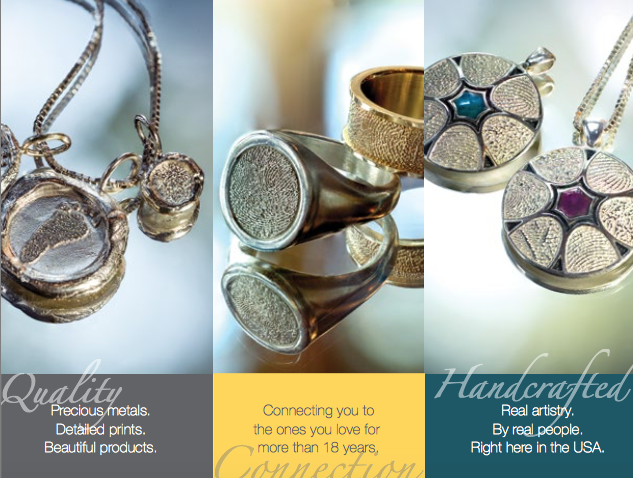 Each item is personalized with your choice of precious metal, gemstone, and engraving. Every keepsake is one of a kind, showcasing a unique fingerprint, footprint, or handprint. Cremation and keepsake jewelry allows one to keep a small portion of cremated remains, a lock of hair, or dried flowers close to one's heart. We offer many styles of fillable keepsake pendents and bracelets. Glass Remembrance memorials are all custom made in the United States and signed by the artist. Cremated remains are swirled inside each piece during the glass blowing process. We offer memorial tribute sculptures, ornaments, pendants, and bracelet beads.